EIN BOKEK, Israel— The Dead Sea is shrinking at the rate of about a meter a year, leaving behind deserted beaches and sinkholes in a slow-motion environmental disaster. The main culprit is the drying up of the Jordan River, its main tributary, as communities upstream draw on it for farming and drinking. But mineral extraction makes the crisis worse—of the 700-800 million cubic meters of water lost each year, 250-350 million cubic meters is due to mining, Israel estimates. Israel wants to re-tender the Dead Sea mining concession as much as eight years ahead of schedule, in 2022. It is motivated not only by environmental concerns but also by worries ICL will hold off on new investments in the concession’s final years. The plant is one of ICL’s core assets, producing potash that goes into fertilizers, bromine for flame retardants and other products sold for billions of dollars worldwide. The company, controlled by billionaire Idan Ofer’s Israel Corp, has not made its position clear. It declined to give an immediate comment on its stance when contacted. 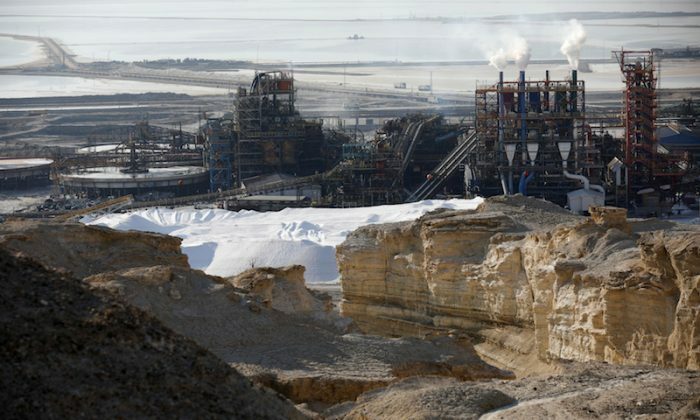 “This is a one-time opportunity, as the concession comes to an end and we enter a new period, to set standards for the factory’s operations and the environmental impact on the whole area,” said Galit Cohen, deputy director-general for policy and planning at the Environmental Protection Ministry. At the moment, ICL is largely free to do whatever it wants to maximize production, Cohen said. “They have no incentive to reduce the amount of water they pump or think about from where they get the earth to build their dikes,” she said. ICL said in a July 5 letter to the committee that its report raised “complicated legal, economic, operational and engineering issues, and ICL has significant reservations about part of what was said in it”. “The company is studying the report and will relate to it as customary within the framework of the public hearing,” ICL said in a statement. Final recommendations due around September are not expected to differ materially from the interim report’s, said a senior government official, who asked not to be identified given the sensitivity of the issue. When the company was privatized in the 1990s, the government kept a “golden share” that gave it some oversight, in addition to the obligation under the terms of the concession that the company seek its approval for any new investment. “I think the company understands it needs to clear the fog regarding the long-term … and not leave its investors feeling uncertain,” he said. With revenue of $5.4 billion in 2017, ICL manufactures a range of products from industrial chemicals to food additives. It is the world’s sixth-largest producer of potash and supplies about a third of the world’s bromine, used in fire retardants. Bidders in a new tender would likely include the usual suspects from the small number of leading potash producers, including Russia’s Uralkali, Germany’s K+S AG, and Canada’s Nutrien, the report said. Committee chair Yoel Naveh said it was possible competitors would be scared off by ICL’s numerous advantages: not just right of first refusal but also its deep knowledge of the project. “The state needs to set a price and below that not give it to a private concessionaire,” he told parliament in June.